It may seem odd that Xining is the provincial capital of Qinghai, especially when you take into account the fact that, up until 1928, it belonged to the province of Gansu. Yet it appears Qinghai has stolen a real gem, as this city has been sought after and warred over for nearly 2,000 years! It has a population of just over 2 million people, most of which are from the Han, Hui, Tu, and Tibetan ethnic groups, although the city is home to 36 of China’s ethnic minorities. It has recently enjoyed much fame and popularity as the starting point for the new Tibetan Railway. Yet this is only a small part of Xining’s illustrious heritage as a centre for travel. During the Han Dynasty (206 BC–220 AD), the city’s proximity to the Hexi Corridor made it a focal trade hub along the Silk Road and thus it enjoyed a period of exponential growth. It functioned as a western stronghold throughout the Sui (581-618) and Tang (618-907) dynasties but was tragically overrun and annexed by the Tibetan Empire in 763. It was eventually recovered in 1104, during the Song Dynasty (960-1279), and was then symbolically renamed Xining or “Peace in the West”. In keeping with this spiritual name, the city is a site of religious significance for both Muslims and Buddhists, with the Dongguan Mosque resting within the city and the Kumbum Monastery just outside of it. 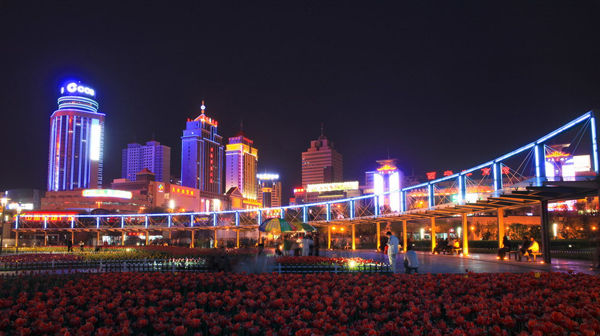 Nowadays the city enjoys a fine reputation as one of the summer resort capitals of China, owing to its temperate, balmy summers. Though in January the temperature can plummet to depths of −7 °C (18 °F), the average July temperature of 17 °C (63 °F) makes Xining far more comfortable than other Chinese cities such as Beijing and Shanghai. It’s the ideal place to get away from the oppressive humidity in other parts of China; just be sure to book a ticket out of there before the icy winter hits! With its substantial Muslim population, Xining is home to over 80 mosques, of which the Dongguan Mosque is undoubtedly its star attraction. It was originally built during the 14th century and is one of the largest mosques in the country. 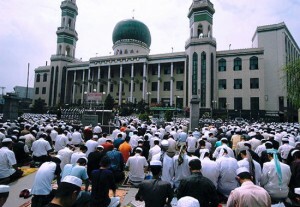 Every Friday it regularly attracts over 50,000 worshippers for lunchtime prayers, while during the festival of Ramadan it can draw crowds of over 300,000. That’s over three times the number of people that attend Reading Festival each year! Within the city itself, the South Mountain Park is a favourite haunt for locals and has a viewing platform from which visitors can take in a breath-taking panorama of the city. It’s a wonderfully secluded slice of greenery and makes for a welcome escape from the hustle and bustle of city life. For those dedicated history nerds, there are numerous spectacular museums littered throughout the city that give an insight into its decorated past. The Qinghai Provincial Museum at the east end of Xining Square is resplendent with historical artefacts that date back thousands of years, including pottery, paintings, and Tibetan carpets. It’s the perfect place to learn about the history of the province and pick up a few souvenirs in the process! The Tibetan Culture and Medicine Museum is another real treat and boasts some excellent displays on traditional Tibetan medicine, astronomy, and science, as well as the culture and lifestyle of the Tibetan people. Its crowning jewel is a 618-metre-long (2,030 ft.) Tibetan thangka or sacred art scroll, which was painted by 400 artists over four years and was finally completed in 1997. To put that into perspective, it’s over twice as long as the Eiffel Tower is high! About 25 kilometres (15 mi) to the southwest of Xining, the Kumbum Monastery welcomes visitors to marvel at its stunning architecture and witness its monks debating over Buddhist sutras. It is the most prestigious Buddhist monastery outside of Tibet and attracts flocks of worshippers every year. Still further, approximately 95 kilometres (60 mi) outside of the city, the colossal Qinghai Lake can be found sprawling its sapphire expanse across the countryside.